Devices sensitive enough to detect and measure minute changes of magnetic fields, called superconducting quantum interference devices (SQUIDs), are opening up practical application of superconductivity outside the laboratory. Some applications that can benefit from using SQUIDs are magnetically levitating (maglev) trains, earthquake detectors, and even solar power cells. Dutch physicist Heike Kamerlingh Onnes discovered superconductivity in 1911 during an experiment involving mercury and liquid helium. When a material's temperature is reduced to a certain threshold, its electrical resistance falls down to zero and the expulsion of its magnetic fields occur. Materials that can achieve superconductive are metals and ceramic materials. The temperature at which superconductivity occurs vary from material to material. Mercury, for example, achieves superconductivity when its temperature is lowered to 4.1K. Without electrical resistance, an electric current can persist indefinitely even without a power source. There is no power loss with superconductors and that any existing power in a superconductive wire will forever flow in it. Superconducting wires can conduct much larger currents than ordinary wire which create much more intense magnetic fields around them. Magnetic Resonance Imaging (MRI) machines, mass spectrometers, and even particle accelerators like the Large Hadron Collider use superconducting magnets (electromagnets made from coils of superconducting wires.). Last year, a research team at the University of Toronto induced high temperature superconductivity in a semiconductor by just using ordinary scotch tape. This is according to a topical review `Superconductivity and the environment: a Roadmap', published today, 16 September, in IOP Publishing's journal Superconductor Science and Technology, which explains how superconducting technologies can move out of laboratories and hospitals and address wider issues such as water purification, earthquake monitoring and the reduction of greenhouse gases. Lance Cooley, a guest editor of the article who is based at the Fermi National Accelerator Laboratory, said: "Superconductivity has been meeting some great challenges over the past 50 years. The Large Hadron Collider, mankind's largest machine, would not exist were it not for superconductivity." "There are many uses of superconductors in other big science projects, laboratory devices, and MRI systems. Now, as the roadmap outlines, new materials and technologies enable researchers and entrepreneurs to be more versatile and apply superconductivity in other ways that contribute to our everyday lives, such as innovations to benefit our environment." By utilising superconducting quantum interference devices (SQUIDs) – very sensitive contraptions that can measure extremely small changes in magnetic fields – one section explains how unexploded weapons, otherwise known as unexploded ordnances (UXOs), can be detected and safely recovered. Thousands of UXOs are still discovered each year around Europe, especially in areas that were heavily bombed during the Second World War. They can be very unstable and still pose a major threat; however, the sheer scale and complexity of the terrain that needs to be surveyed makes detecting them very complicated. A section by Pascal Febvre, from the University of Savoie, explains how a complete network of SQUIDs dotted around the globe could also aid the detection of solar bursts which send magnetic particles hurtling towards Earth, potentially wreaking havoc with our communication systems. A similar network of SQUIDs could also help detect the specific magnetic signature of Earthquakes before they strike. One area already progressing with the help of superconducting technology is high-speed rail travel. 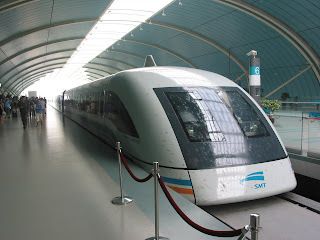 Magnetically levitating (Maglev) trains, whereby the carriage is levitated by magnets and has no contact with the track, have already been deployed in Germany, China, Japan and Brazil. These countries are now looking to develop high temperature superconducting maglev trains which use liquid nitrogen instead of liquid helium to cool the tracks. This is expected to simplify the cooling process, reduce operational costs, offer more stable levitation and allow lighter carriages to be used, according to Motoaki Terai from the Central Japan Railway Company. Kyeongdal Choi and Woo Seok Kim, from Korea Polytechnic University, explain how high temperature superconducting technologies can be used to effectively store power from wind and solar plants, as the weather dictates how much power can be generated at any one time, unlike non-renewable sources such as coal and oil which have a constant output. Superconducting cables could also carry an electrical current with no resistance across large distances from the wind and solar power plants to cities and towns. According to Steven Eckroad, from the Electric Power Research Institute, and Adela Marian, from the Institute for Advanced Sustainability Studies, advances in cryogenics, the development of low-cost wires and ac-to-dc current converters will make this technology cost-effective and environmentally friendly. Professor Shigehiro Nishijima of Osaka University points out the increasing need for clean water for domestic purposes and describes the possibility of using high field magnetic separation systems based on superconducting magnets for this purpose.